I hope everyone had a lovely Christmas! While not everyday can be Christmas, it always feels like Christmas Eve to me when I’m travelling. Some people only like certain aspects of travelling. (Most don’t like the actual ‘getting there’ process). Call me strange, but I like all stages of it. Planning, choosing, booking, boarding, flying, arriving, staying, exploring — everything. I even love plane food. So while I was sad to leave London (which I’ve endlessly harped on this blog as my favourite city), I was excited to fly Cathay Pacific from London to Sydney (via Hong Kong). 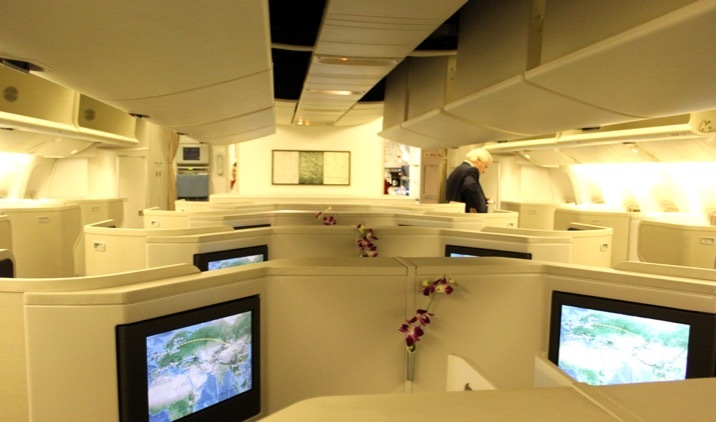 This flight is kind of significant because London is Cathay Pacific’s first European destination, and they were the first airline to fly the beloved (but recently retired) Boeing 747-200 on the Hong Kong – London (and vice versa) route. The very first flight on this route happened July 16, 1980. Here’s a review on the London to Hong Kong route, 34 years later. 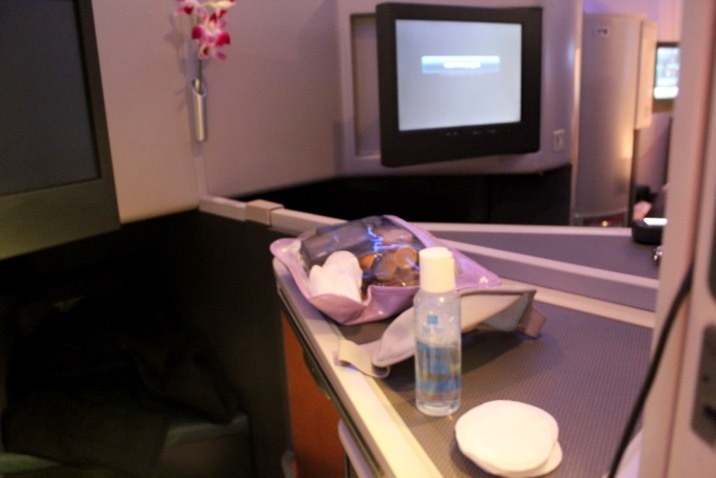 The business class cabin is clean, spacious and no-nonsense. Minimalists will love the functional design of the cabin, with no fancy and frilly embellishments, save for the signature orchid in the middle rows. In a 1-2-1 configuration, all passengers have aisle seats. As I was travelling with my mom, we were assigned the middle seats next to each other, which was nice to try as I had a window seat on my Sydney to Hong Kong flight. 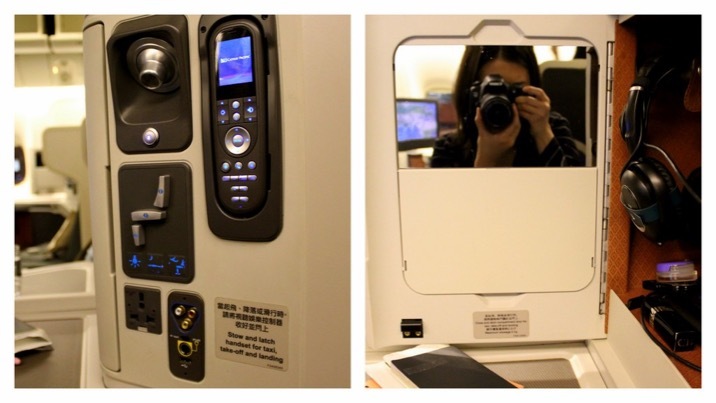 There are 40 lie-flat business class seats on the aircraft, and I was seated on 18D. When we entered the cabin, we were greeted very warmly with a “Good Evening”, and then the cabin crew looked at us, and excitedly asked, “Mother and daughter?” then immediately offered to take a photograph of us. (I haven’t even pulled out my camera at this stage). This was probably the warmest and friendliest greeting I have received in a Cathay Pacific flight. 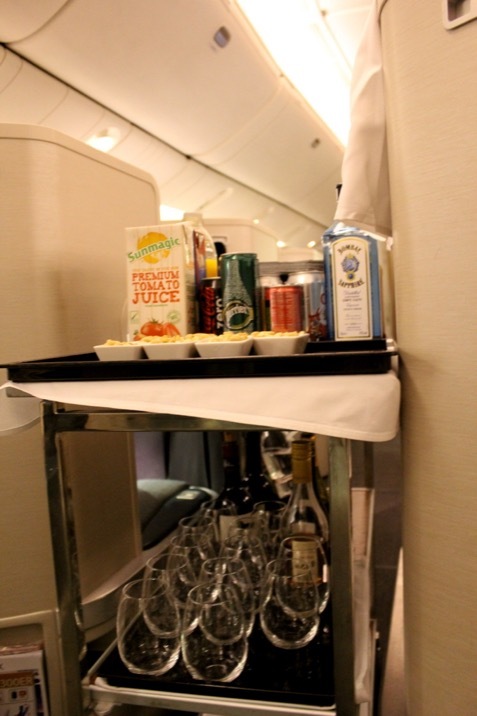 Drinks were immediately served upon boarding. And it was great to know that we were not flying over “hot” areas. There’s quite a generous table space in between seats. 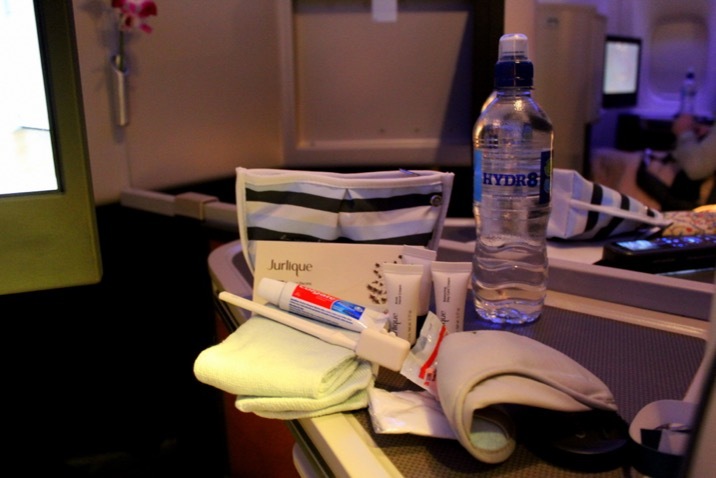 I was able to do my in-flight facial spa routine on this flight as there was no lack of storage space at all. 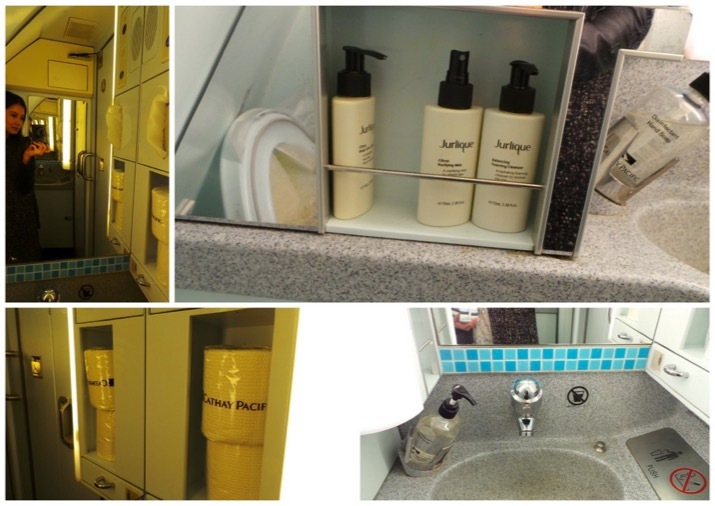 Amenity kit case is by designer Agnes B, and inside are 3 tubes of Jurlique Products – Hand Cream, Lip Balm and Day Cream. There’s a pair of socks, eye mask, ear plugs, toothpaste and toothbrush (the quality of which will last you more than one time use). Everyone also received a full-sized bottle of water. Entertainment system was really comprehensive with hundreds of choices for Movies, TV Shows, Documentaries, and Music. For some reason, I preferred the movie selections in October (when I took my outbound flight). There were more classic titles. However, the November movie choices offered a lot of newer titles. I was not able to take a photograph of the seat transformed into a lie-flat bed for this London t0 Hong Kong flight, but above is a photograph of my seat on my outbound flight from Sydney to Hong Kong. Granted, they are not the same aircraft. But they do have the same seat structure. 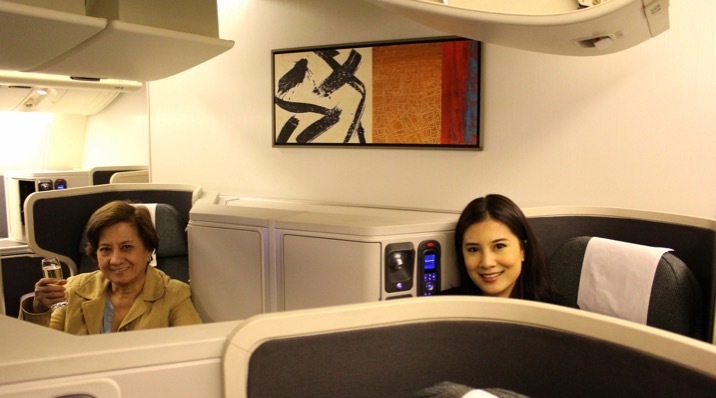 The business class seats turns to a 180-degree lie flat bed, but as always don’t sleep 180 degrees. I leave about 10-20 degrees left in the incline, as this is much more comfortable. 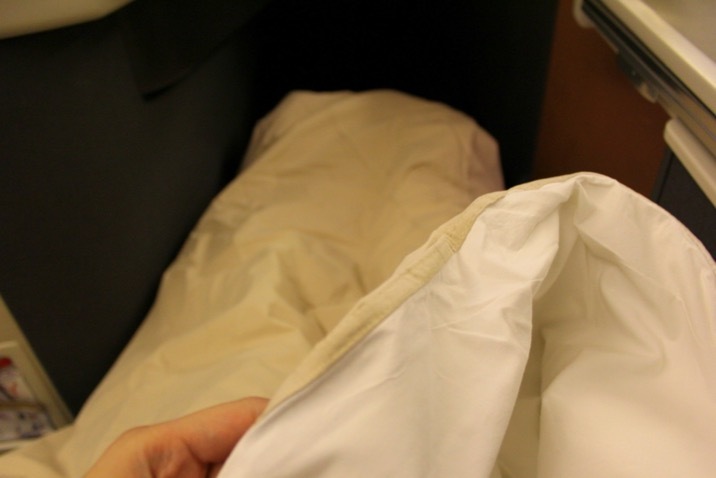 The business class blankets are thick and has a clean and crisp feel. Aperitif was served after the seatbelt signs were off. The cashew nuts served were in tiny glass dishes but the cabin crew are quick to replenish when they see your dish about to empty. They seem to have a third eye for these cashew nut-stock as I had to actually refuse the 3rd offer for a re-fill! As the flight departed at 20:40 (8:40 pm), Dinner was the first meal. And following the body’s natural clock (not the actual flight time arrival), the next meal served was breakfast, even though we landed at 16:15 (4:15 pm) in Hong Kong. And I really appreciated this meal plan! Starter was Chicken and Duck Terrine with Quince and Apricot Compote with Beetroot Tartare. On any given day, I’m not a fan of Terrine-anything, though I did cut a few small squares which I mixed into the salad, which was very crisp and fresh. 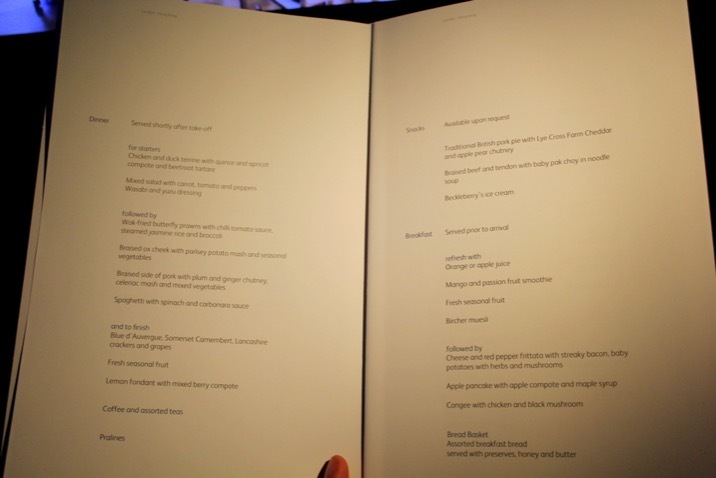 On my Sydney to Hong Kong flight, I was quite impressed with how the cabin crew brought all 4 choices for main meals (by hand) for passengers to choose from. I was even more impressed on this flight, when they took this service to the next level by actually putting all meal choices on an open trolley. 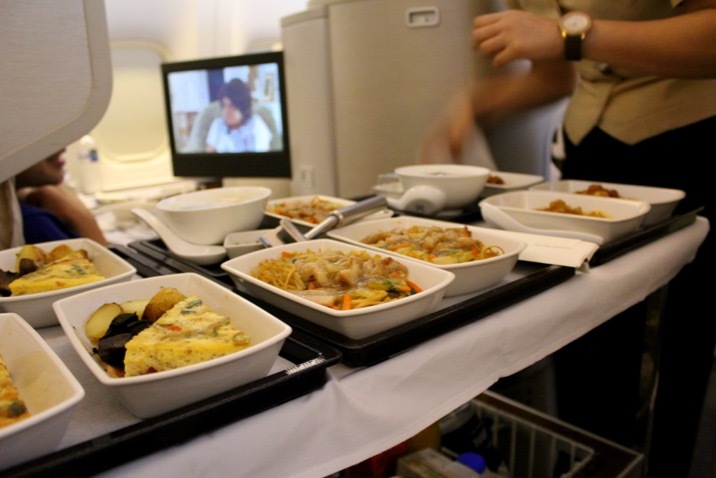 I seriously felt like this is Yum-Cha at 37,000 feet! I really like this way of serving the main meals. It’s really considerate because words and fancy phrases of meals on menu alone won’t do. I can’t count the number of times when I’ve had the “picker’s remorse” wherein I’ve confidently chosen a meal based on the airline menu, then end up enviously staring at the more appetising-looking meal of the person next to me. This time though, I already knew my choice even without seeing it. I’m a seafood lover so it was a no-brainer to pick this. 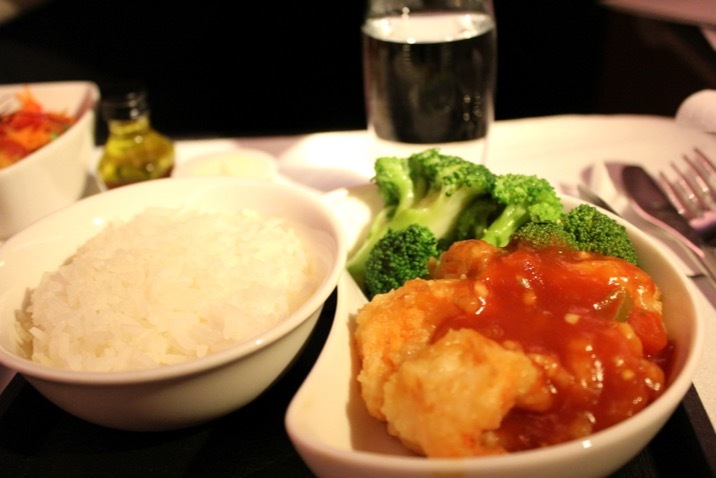 Wok fried Butterfly Prawns with Chili Tomato Sauce, steamed Jasmine Rice and Broccoli. Now I’m one of those people who would rather skimp on the main meal in order to make room for dessert. 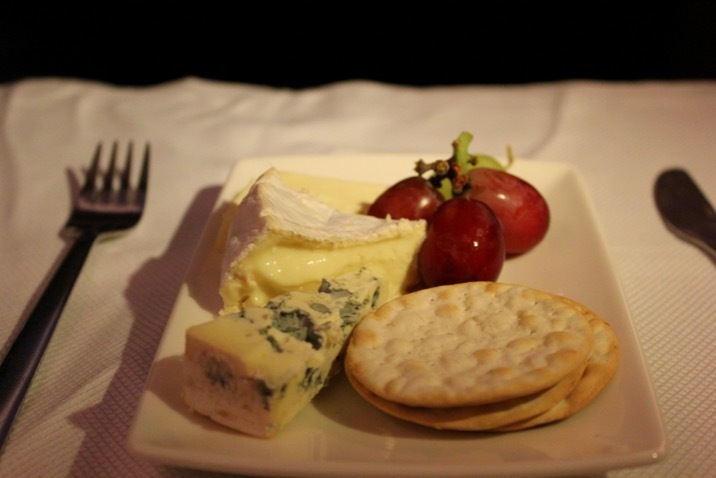 Blue D’Auvergue, Somerset Camembert, Lancashire crackers and Grapes. 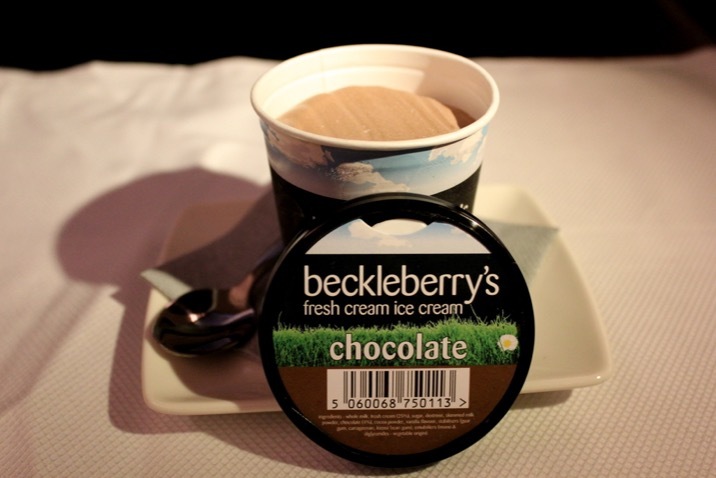 Tell me, how can I refuse a name like Beckleberry’s Fresh Cream Ice Cream? I love airplane ice cream. They are rock hard and impossible to scoop out. It is beyond cold that when you first bite into it, your palate doesn’t know if its hot or cold. I know it sounds strange but ice cream to me tastes better that way. And I also love the waiting game involved to see whether the ice cream has softened enough for you to eat it without chiseling into it. 8 hours later, breakfast was served. 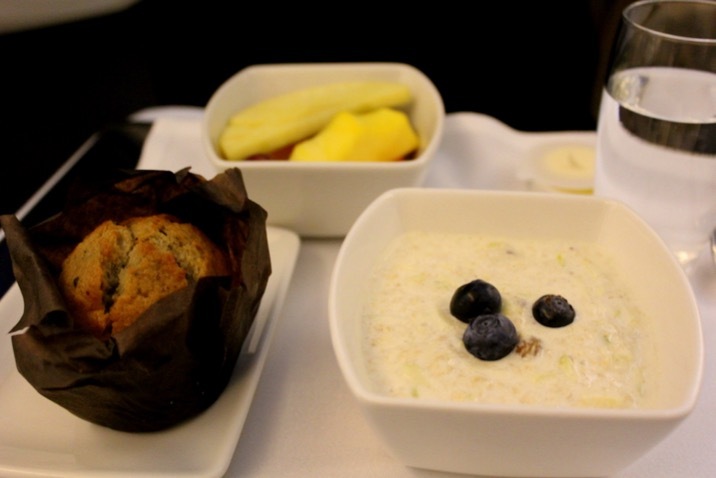 Everyone received a tray of bircher muesli, muffin and fruits. Now the main breakfast, I was slightly confused because the meal I chose was not in the menu at all. Everything on the menu was also offered on the tray. I think what I chose was an extra offering. I chose stir fried noodles with diced chicken and vegetables. The noodle texture was great and not rubbery. The vegetables were rather limp but overall it was a good pick-me-up meal after sleeping for 5 hours. I was extremely satisfied with this flight. 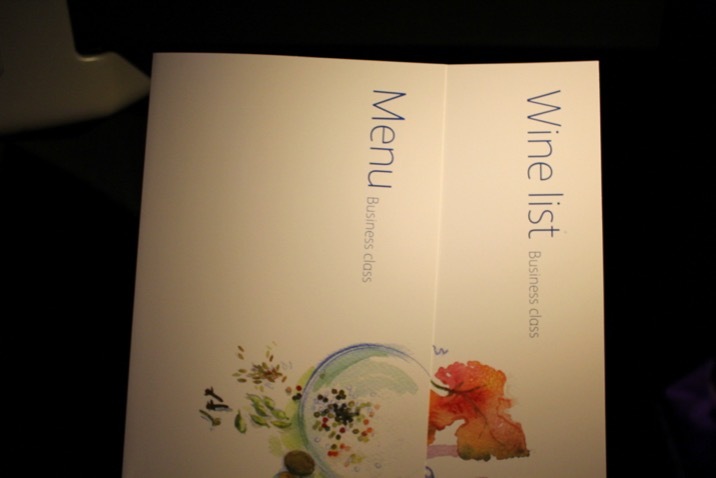 Cathay Pacific definitely knows that food is the way to most passengers’ hearts and I really like how they’ve done the meal service. It definitely makes you feel like you just entered a flying restaurant. 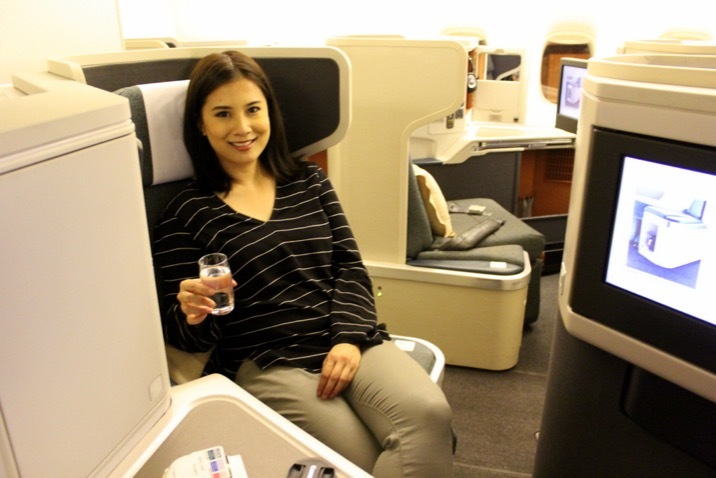 I also enjoyed the moderate flight duration flying from Australia to Europe (and vice versa) with Cathay Pacific. With Hong Kong as it’s hub, the flight times are divided almost equally. Take for example, this return flight. 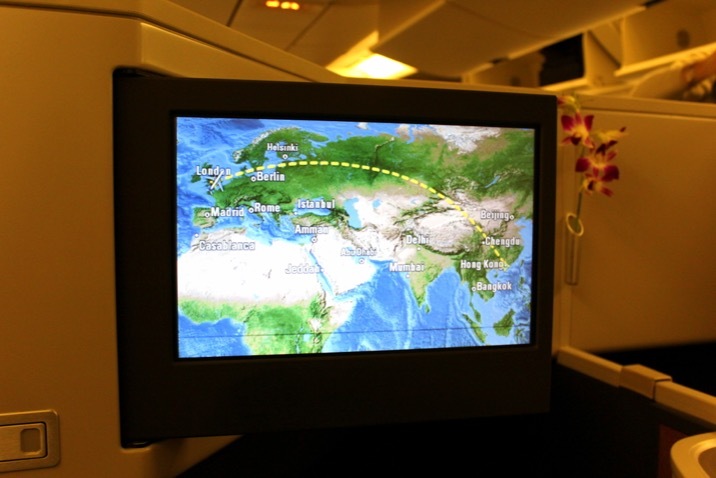 London to Hong Kong is 10 Hours 40 Minutes, and Hong Kong to Sydney is about 8 hours. Let’s compare that to an airline whose hub is, let’s say, the Middle East: Sure, the flight time from Europe to the Middle East will likely be under 7 hours. But the journey back from Middle East to Australia will be almost 14 hours. Their total flight hours may be roughly the same, but it’s the flight time of each leg that makes the difference. 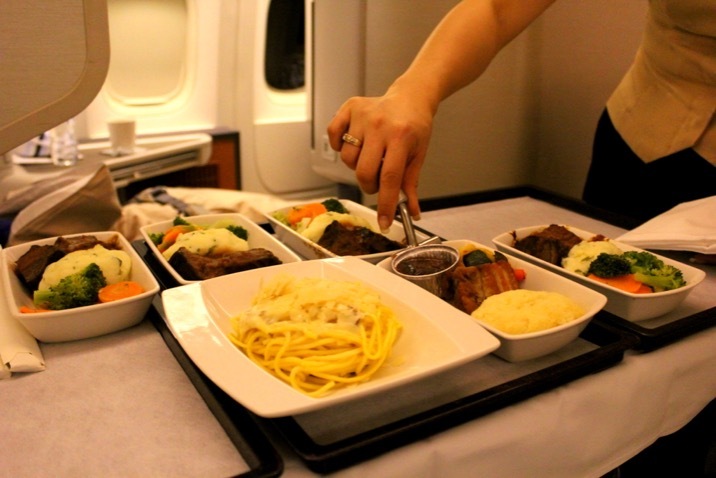 Now I’d love to know: Does airline food and / or flight time make a difference to you when choosing an airline? 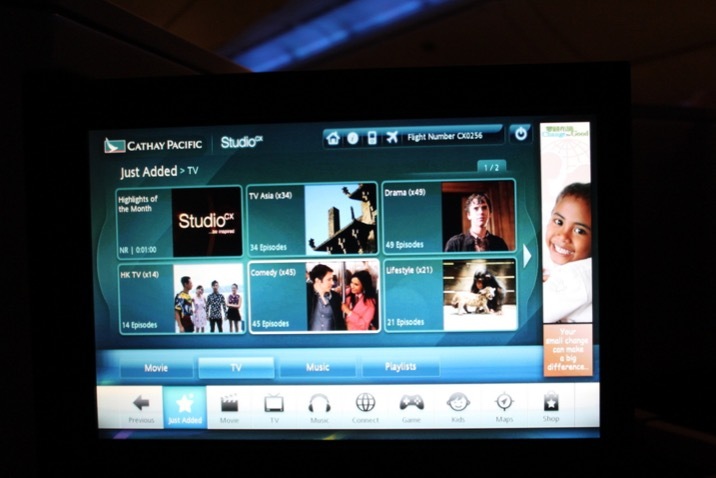 I flew with the assistance of Cathay Pacific, but this has not swayed my thoughts or opinions of this review. Me too!!! Their noodles were really good. And just the right size for consumption on flights. Thanks so much Tony! 🙂 Yes Cathay Pacific is really quite a good option for you to fly in the Austral-Asian hemisphere from London. Great connecting times too and perhaps reason for you to stop over in Hong Kong, where the food is absolutely fantastic! So glad to hear that I motivate you and Laura to travel! Looking forward to your Asian trip happening soon! I enjoyed my CP business class flight too. The privacy screens are great! That pic of you and your mum is very sweet. 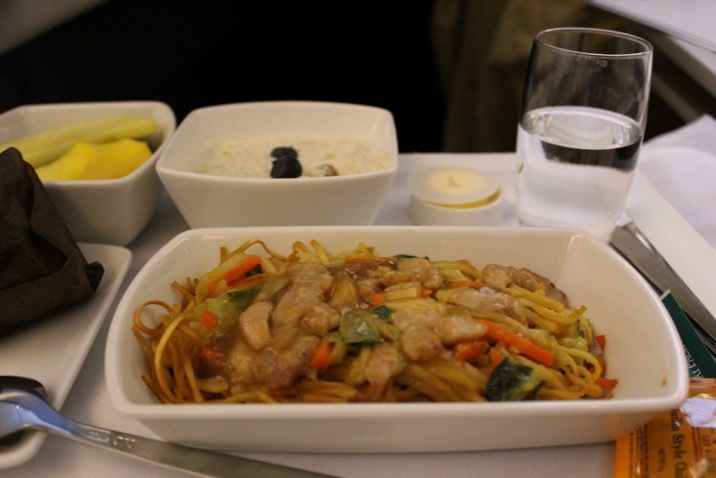 I like Asian airlines as the food is often good on them. How funny is the ice cream though! It’s so hard at first!! i love this review and really want to try out Cathay although im torn as i love Singapore Airlines so much!! 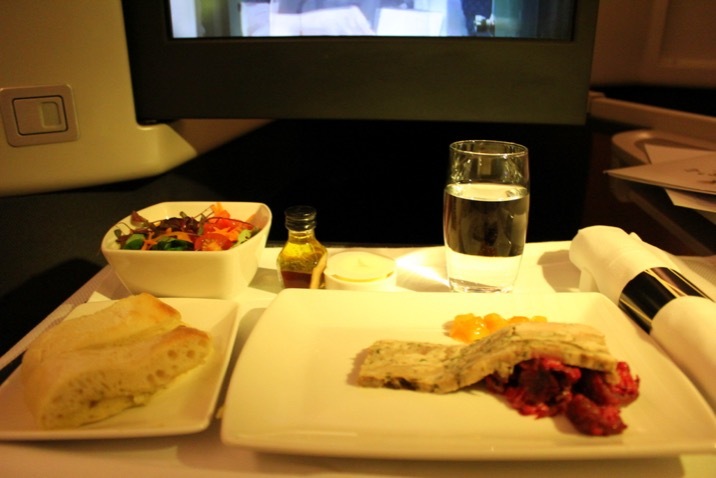 And i agree i usually enjoy airline food, it isnt as bad as people harp on about, specially in business class!! Excellent review and looks like an amazing experience! 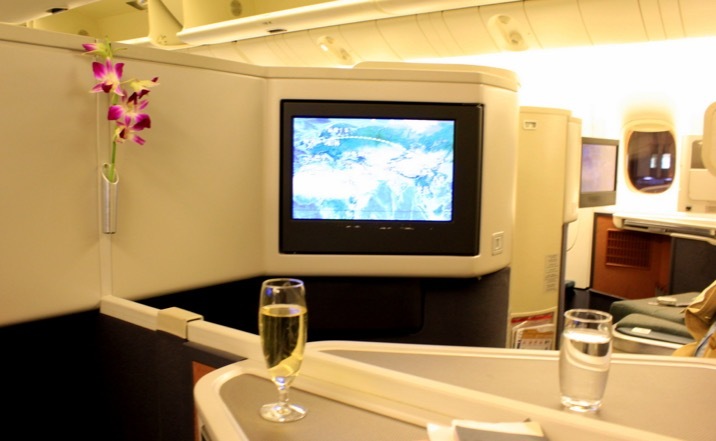 I’d love to fly business class on Cathay Pacific and as you noted it’s great flying via Hong Kong to have the trip split more evenly. A couple years ago we flew to Australia with Emirates which was great because we stopped over in Dubai and stayed with old friends. The bummer was the flight from Dubai to Melbourne was 14 hours, as you mentioned! I’ve only flown Delta’s business class transatlantic as we have a family friend who works for the airline. 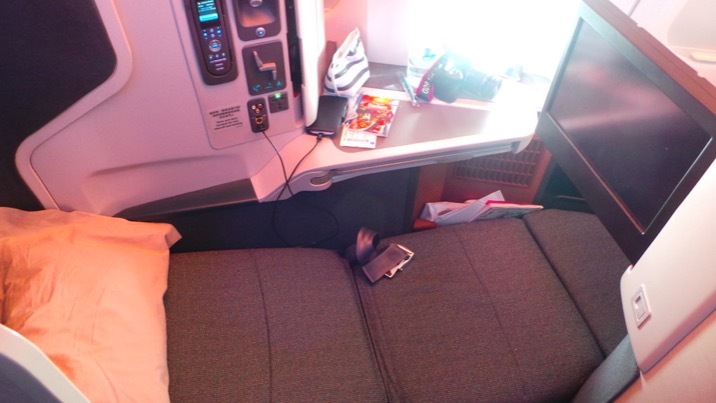 This past October I flew from Boston to London in business class and slept in the fully flat bed for the first time. It was a great experience! I wouldn’t have minded if the flight was 11 hours rather than 7 hours 😉 While Delta has upgraded to the current industry standard of transcontinental business class I didn’t think the food was as good as it used to be. They used to serve nice, fresh warm nuts as one of the snacks and they did away with that. The size of the meals were also smaller. So while I’ve noticed some things with Delta have improved, some things have regressed in their BusinessElite cabin. Hi Alex! Thank you it was really a great experience. Especially the food! I’m not a true-blue foodie but this flight really made me appreciate great plane food , especially the presentation. Thanks again, I’ve still got a Hong kong – Sydney review coming up!